lottaholm – Thoughts about data and insights. About media, audiences and technology. Perhaps the really really coolest thing about data is when it starts talking to you. Well, not literally, but as a figure of speech. When you’ve been working on a set of raw data, spent hours cleaning it, twisting it around and getting to know it. Tried some things, not found anything, tried something else. And then suddenly it’s there. The story the data wants to tell. It’s fascinating and I know that I, at least, can get very excited about unraveling the secrets of the data at hand. And it really doesn’t need to be that much analysis behind it either, sometimes it’s just plain simple data that you haven’t looked at like that before. Like this past week when we’ve had both the icehockey world championships and the Eurovision Song Contest going on. Both of them events that are covered by our newspaper and both of them with potential to attract lots of readers. Which they have done. But the thing that has surprised me this week is how different the two audiences behave. Where the ESC-fans find our articles on social media and end up on our site mainly via Facebook, the hockey fans come directly to our site. This is very interesting and definitely needs to be looked into more in depth. It raises a million questions, the first and foremost: How have I not seen this before? Is this the normal behaviour of these two groups of readers? Why do they behave like this? And how can we leverage on this information? Clicking on See Details the told me that the problem had something to do with the connection to the data. Alas, contacting the data source owner would not be of any help as the data source owner happens to be yours truly, and I was sure that I hadn’t made any changes to the data source. At this point I was starting to become a little bit alarmed. What could have happened to the data source? So in the end, all dashboards are now again up and running, although it was somewhat annoying having to go through all dashboards and “reconnect” to a data source I already am the owner of. NPS (Net Promoter Score) is a popular way to measure customer satisfaction. The NPS score is supposed to correlate with growth and as such of course appeals to management teams. The idea is simple, you ask the customer how likely he or she is to recommend your product/service to others on a scale from 0 to 10. Then you calculate the score by subtracting the sum of zeros to sixes from the sum of nines and tens. If the score is positive it is supposed to indicate growth, if it is negative it is supposed to indicate decline. My employer is a news company publishing newspapers and sites mainly in swedish (some finnish too). Therefore we mainly use the key question in swedish, i.e. Hur sannolikt skulle du rekommendera X till dina vänner? This wording, although an exact mach to the original (How likely is it that you would recommend X to a friend?) seems a little bit clumsy in swedish. We would prefer to use a more direct wording, i.e. Skulle du rekommentera X till dina vänner? which would translate into Would you recommend X to a friend? However, we were a bit hesitant to change the wordin without solid proof that it would not affect the answers. So we decided to test it. We randomely asked our readers either the original key question or the modified one. The total amount of answers was 1521. Then, using R and the wilcox.test() function, I analysed the answers and could conclude that there is no difference in the results whichever way we are asking the question. There is some criticism out there about using the NPS and I catch myself wondering every now and again if people are getting too used to the scale for it to be accurate any more. Also, here in Finland there is a small risk that people mix the scale with the scale 4-10 which is commonly used in schools and therefore apply their opinions to their years old impression about what is considered good and what is considered bad. I’d very much like to see some research about it. Nevertheless, we are nowaday happily using the shorter version of the NPS key question. And have not found any reason why not to. Perhaps it could be altered in other languages too? The presidential elections 2018 in Finland were quite lame. The incumbent president, Sauli Niinistö, was a very strong candidate from the offset and was predicted to win in the first round, which he did. You can read more about the elections for instance on Wikipedia. Boring election or not, from an analytics perspective there is always something interesting to learn. So I dug into the data and tried to understand how the elections had played out on our site, hbl.fi (which is the largest swedish language news site in Finland). We published a total of 275 articles about the presidential election of 2018. 15 of these were published already in 2016, but the vast majority (123) was pubslished in January 2018. Not much interesting going on there. So, I also took a look at the traffic coming in via social media. Twitter is big in certain circles, but not really that important a driver of traffic to our site. Facebook, on the other hand, is quite interesting. Using Supermetrics again, and doing some manual(!) work too, I matched the Facebook post reach for a selection of our articles to the unsampled pageviews measured by Google Analytics. From this, it is apparent that approximately one in ten persons reached on Facebook ended up reading our articles on our site. Or more, as we know that some of the social media traffic is dark. The problem with traffic that originates from Facebook is that people tend to jump in and read one article and then jump out again. Regarding the presidential elections this was painfully clear, the average pageviews was down to 1,2 for sessions originating from Facebook. You can picture this as: Four out of five people read only the one article that was linked to Facebook and then they leave our site. One out of five person reads an additional article and then decides to leave. But nobody reads three or more articles. This is something to think about – we get a good amount of traffic on these articles from Facebook but then we are not that good at keeping the readers on board. There’s certainly room for improvement. Apart from telling us which candidates attracted the most pageviews, this also clearly shows how many articles were written about which candidate. A quite simple graph in itself, a scatter diagram coloured by the metadata, but revealing a lot of information. From this graph there are several take aways; at what time should we (not) publish, which candidates did our readers find interesting, should we have written more/less about one candidate or the other. 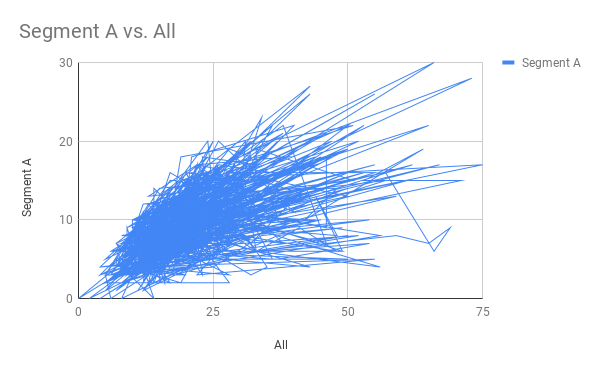 When you plot these graphs for all different kinds of meta data, you get a quite interesting story to tell the editors! A note about the graphs: The first graph in this post was made with Google Sheets’ chart function. It was an easy to use, and good enough, solution to tell the story of the pageviews. Why use something more fancy? The second graph I drew in Tableau, as the visualisation options are so much better there than in other tools. I like using the optimal tool for the task, not overkilling easy stuff with importing it to Tableau, but also not settling for lesser quality when there is a solution using a more advanced tool. If I had the need to plot the same graphs over and over again, I would go with an R-script to decrease the need of manual clicking and pointing.